This time we'll discuss the commonly called Stereo Room mics. This topic will take us quite some time because, personally, I think it's crucial. 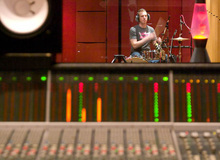 For a long time I asked myself where I should put this sub-chapter dedicated to Stereo Room mics within the chapter dedicated to drums recording. In the end, I decided to put it together with the additional close mic tracks because, on the one hand, it's not "self-sufficient" (except for some anecdotal rare effects) and, on the other, you can actually do without these mics during mixdown with the help of some tricks... Reverb, did anyone say reverb? Anyway, that's not today's topic. I mean, the fact that you can do away with these mics is good news if you don't have enough mics, preamps or inputs on your interface, as is usually the case in home studios. However, if you do have enough gear I would definitely recommend you to go for it, given their utility. In fact, adding an artificial Stereo Room during mixdown is nothing but a consolation prize compared to a true room recording worthy of the name. And even more so considering the role this track plays in the overall sound of the drums. But let me warn you before we move on: this installment might seem a bit frustrating because we won't delve into the "hows." Today we'll focus on the "whys" so you can really grasp what's at stake, which will allow you to put the theory into practice more easily. Trust me, thinking before acting is a fundamental principle in the audio world. If you listen to what we've recorded so far, you'll realize that we probably have enough material to make a pretty decent transcription of the drums. If I were to receive a mix with these tracks I'd have enough to work seriously. However, I would have a hard time getting off from my chair saying it's all done. It would still lack "something," don't you think? I could obviously use some EQ, compression and reverb to retouch it and make it seem more lively. 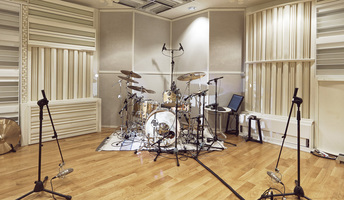 But since you are at the recording stage, there's much more you can do to get a better result, sparing you from having to "photoshop" your sound excessively in the mixing stage. Indeed, a Stereo Room track will help you provide the drums with that extra "something" that will make all the difference. Think of it as a layer of lacquer that will give your sound the finishing touch. A small trick that will reveal the true character of your drum takes. What is so miraculous about it, you ask? Well, if you think about it, as a listener you will most probably never be in the position of any of the mics we have used so far to capture the drums, will you? And that's perfectly fine, your eardrums will be truly grateful. The Stereo Room tracks are recorded relatively far from the kit, which is much more similar to how anybody actually listens to the drums. So it makes sense that this recording provides that extra something that will make all the difference. By capturing more or less faithfully the room where the recording is taking place, the Stereo Room tracks allows you to play with the sensation of space, air and depth of the instrument. In short, these recordings define the liveliness of the drums. All the clips begin without the Stereo Room mics to then add them gradually. Enlightening, isn't it? In the coming weeks I will explain how we achieved this. Unfortunately, there's no single way to proceed, as is usually the case in the fascinating world of recording. That's why we'll also look at other techniques which, hopefully, will allow you to tackle any situation you might face. In the meantime, I invite you to share with all of us your thoughts on this in the comments section.